This is truly beautiful piece of hand made working dog equipment! One of the best available harnesses. 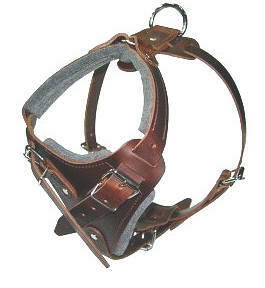 The Fordogtrainer dog harness is some of the most functional and handsome on the market today. 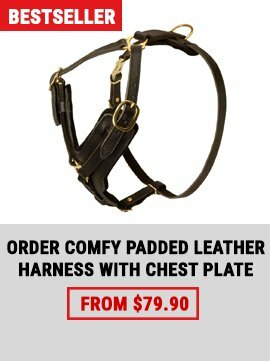 A precisely designed breast plate is lined with extra thick felt to offer supreme comfort for your dog. 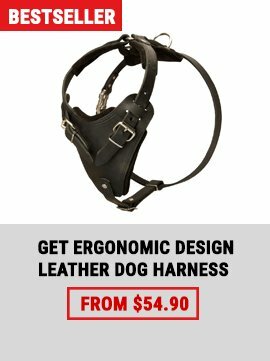 The harness is designed to fit almost any sized working dogs. It's five way adjustable so you can adjust it to fit to your dogs dimensions. Designed so the resistance is on the shoulders and not on the throat our dog harness allows dogs to bark and track in free way and still be restrained enough. 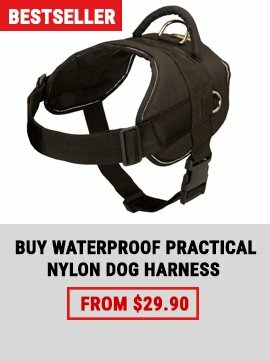 Best place to buy leather dog harness, spiked dog harness,nylon dog harness,walking dog harness for your dog!